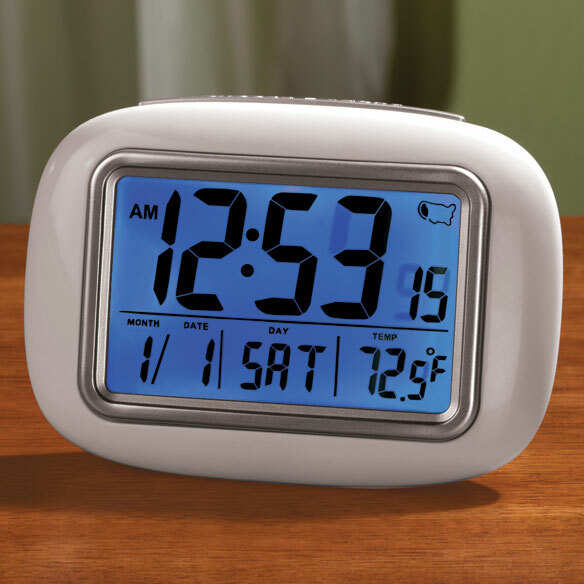 Radio-controlled large screen clock has a digital readout that includes time with seconds, day, date, temperature, time zone, and alarm with 5-minute snooze. The self-setting big screen atomic clock uses 2 AAA batteries (not included). 5 1/2" x 3 1/2" x 2 1/4". I keep mine on the night stand. It's easy to see at nightas it lights up.You can see the time, day, date, temperature. It's a very good bargain. Thinking about buying a 2nd for a back up. Personely I did not care for this clock. It did have a bright blue light. Did not stay on all time and alarm not loud enough. I gave it away. I wanted this clock in my bedroom to see the time in the dark when I wake up - must use backlighting to see numbers in dark - moved it to my bathroom to use for taking meds on correct days but it changes dates and times at various times, so more times than not, the date is wrong - it was given to me as a gift, so doubt returning it is an option. I find this clock very difficult to read (my vision is good) and hard to set. Disappointing purchase. Need it a new clock. Need it and good reviews. For my father. To remind him of the day and date. They are for a 93-year old gentleman who lives alone. does what I want, and price is right. So I’ll know what the date is, time,etc. Needed this to see at night. Great Features, as a Caregiver it is important for me to stay on schedule, this will help. The one I have now is a plug in and every time the electricity goes out I need to reset it. Also for my friend! Who is always late! I want it for my bedroom. Sister liked mine when I showed it to her, she didn't want a radio alarm clock. We lost our prized travel clock during our last trip. This is larger, but has such good features. Also, sometimes we want a back-up to our electric clock. I have a feeling that this will be used for more than travel. Does this clock really have a bright blue background? BEST ANSWER: Yes, but only when you tap the bar on top. The background lights up for about 5 seconds then goes out. Yes, but only when the top bar is depressed and held down.. Otherwise the face is unlit. No It only turns Blue if you press the light button.